It is not easy for residents of New Delhi’s largest resettlement colony to rush out of their homes and scramble to fill water jars on cold, foggy winter mornings when they hear a water tanker arrive. But after living without access to a tap for years, the 30,000 residents of this area are grateful when the tanker shows up every day. “We used to bring water from such a long distance. We could not even offer anyone a glass of water, we had to keep it for our children,” recalls Urmila Devi, one of the residents. For years, the residents struggled without basic civic amenities in this distant suburb where they were relocated from city slums when the Indian capital was being dressed up for the 2010 Commonwealth Games. That has changed now that women like Devi have learned how to exercise their legal rights to access basic services. 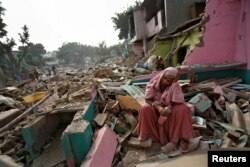 A woman reacts amid the rubble of her home in a slum which was razed to the ground by local authorities in a bid to relocate the residents, Delhi, India, November 2, 2017. Using a law that empowers Indians to seek information from the government to promote accountability and transparency, these women waged an effective campaign with city authorities to improve access to water, sanitation and transport. Their success is a rare example of economically disadvantaged people using the Right to Information Act to transform their community. Filing applications under this law, they found out that water tankers allocated to their area were often going elsewhere – a common practice in a city where water shortages prompt residents of other areas to buy the water from the tankers. The complaints prompted local authorities to fit the tankers with GPS trackers to ensure they reach their destination. Since then the tankers have arrived regularly easing off their water woes. An automated water dispensing unit has been installed in case household supplies run low. FILE - An Indian man is seen surfing the internet in New Delhi. But the queries have rarely come from poorer communities. However activists hope this resettlement colony, where the battle for water prompted a sustained campaign for other services such as public toilets and buses, will show the way to others. Once poorly served by public transport, more buses now come to the area, easing commuting woes. A health center has been built and a community center is also coming up. These barely literate women learned how to handle the paper work and deal with city officials under a project led by the non-profit Marg. It was not an easy endeavor. Urmila Devi and the other women recall traveling for miles to attend meetings. After being accustomed to living on the margins for years, they were confused when they were told they had civic rights. And it took almost a year to understand how to petition authorities. “Initially our writing was crooked. But gradually it improved. The young girls and boys involved in our project here helped us,” said Devi. The women were motivated to learn because they were the worst hit by the lack of amenities, points out Mohammed Noor Alam, a program manager at Marg, who has been at the forefront of the program to train the women. “Water became the test case on which they were able to learn, prove to themselves that they can achieve their rights. And the women brought about change,” he pointed out. A Rohingya refugee woman draws water from a hand pump at a temporary shelter in New Delhi, India, Aug. 16, 2017. It was a slow, gradual process that has set fire to their ambitions to transform their area. Women like Nazra Khatun are now turning their attention to social problems such as safety for women and young girls. “We feel empowered after our efforts. We want to work to end domestic violence here and have more harmony in homes,” she said. The power of activism has turned these women into community leaders. Alam said empowering women in this manner could help millions of residents who crowd slums in sprawling Indian cities. “They are like hawks who keep a watch on everything. If you see holistically such change led by women can transform the entire society,” he said. Chants for a pipeline are now ringing loud in the narrow lanes of this resettlement colony.